When they held the first games in April at Pinehurst Resort, two or three people showed up, Van Zanten said. 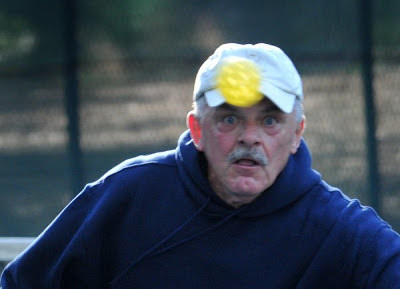 A group of Pickleball players from Cary demonstrated the sport in June. Later in the summer, about 15 to 20 people were playing. Now about 35 are playing regularly, Van Zanten said. "In wintertime we thought it would slow down, but it hasn't," he said. Van Zanten said he expects as many as 50 people will be playing by May. The group already meets six times a week for games. "We were blown away by how fast this has taken hold," he said. "Everybody has a lot of fun."